Below are the results from November’s monthly tournament at Game Preserve. Holy moly, 28 players! That’s our new record, and we were even missing several regulars. Congrats to Phil Grimaldi for winning the A-Division (Go me!) and Carey Fishman for winning the B-Division. Heads up, we will not be having a monthly tournament in December. There is just too much going on that month. We’ll pick back up again in January. Final results from the regular season are posted below. Thanks for coming out everyone! I had a great time — hope you did too! Remember that final playoffs are next week. Playoff positions are listed in the table. Please let me know if you intend to play in the playoffs. It costs $15 to play. That money will go towards trophies and payouts to the winner. Below are the results from Week 4. Sorry for the delay, was very busy last week. Sorry for the delay in posting! Overall League results plus Week 3 are shown below. Total’ shows the total number of points, minus the 2 lowest weeks. Rank is based on Total’. 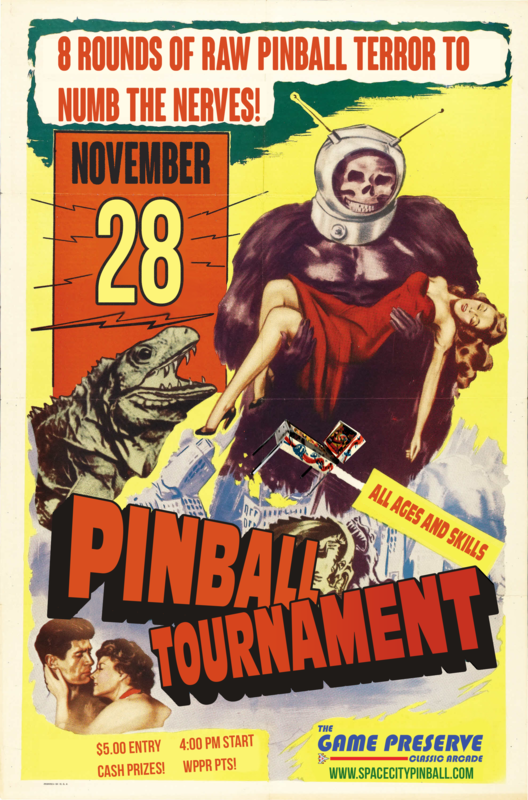 The next monthly tournament of the Space City Pinball League will be on Saturday November 28 at The Game Preserve. As always, all skill levels and ages are welcome. Rules can be found on the “Game Preserve Monthly Tournaments” tab. Note the new start time of 4:00 PM.